I finally did it, I got the shot that I've been trying to get for years!! 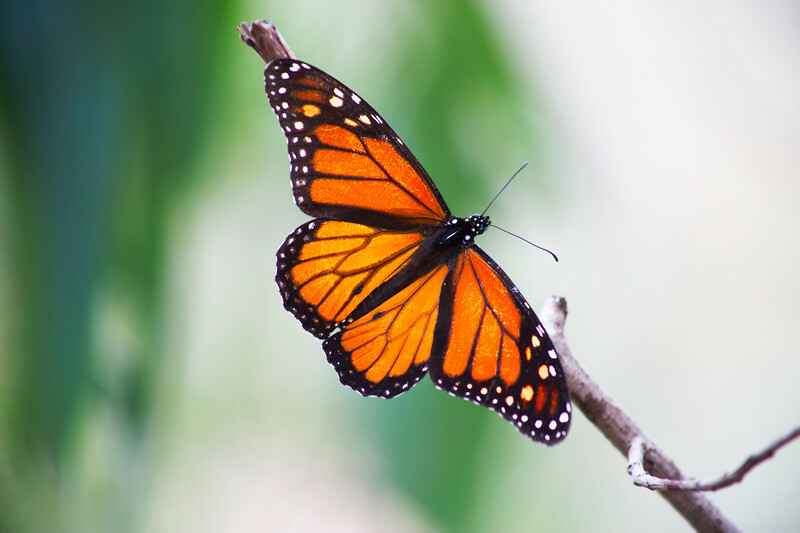 The monarch butterfly migrates to Santa Cruz yearly and every year we go down to see the butterflies, and every year we miss the large troves of butterflies that land there. This year we finally went on a date and made our way down the quiet ramp that leads to this beautiful garden of butterflies. While down with the butterflies I got several shots of large kaleidoscopes of butterflies, but just wasn't able to single out a butterfly that was close enough to me to get a good shot. After about an hour of butterfly hunting, randomly talking to strangers and looking like a complete fool as I hung precariously off the ramp to try and get that one last shot, I gave up and resided to just "getting the shot I want next year". With a heavy heart we made our way up the ramp, with my camera still hung around my neck as we walked, about halfway up the ramp, way far away from all the other butterflies was this beautiful guy chilling on this branch in the most perfect position, it was almost as if he was put there just for me. My camera was up and ready even before I reached him, I did not want to miss this final chance to get the perfect shot. He did dance around a bit but for the most part he stayed right where I needed him (yes it's a male butterfly, the two black pouches on his lower wings prove that he's a male) and I completely appreciated that. I was grinning like a small child on Christmas eve waiting for Santa as I left the butterfly cove with what I knew was the perfect picture!